Can I benefit from virotherapy in Australia without leaving the country? Is it possible to administer Rigvir® at home? Doctor said my biopsy was positive for cancer cells. How much will Rigvir® cost and how long is the treatment? PET/CT scanning revealed metastases. Will Rigvir® help? If you have similar questions, welcome on board. The purpose of the article is to increase awareness among Australians about virotherapy and how to get access to it. How Rigvir® works? Rigvir® derives from Riga virus, which is able to focus on malignant cells in your body and destroy them. Such means of cancer treatment was invented in Riga, Latvia, more than a half century ago. When Rigvir® is administered into your muscle, the virus then travels through your body in search of cancer cells. Once the malignancy is detected, the vaccine attacks the tumor from the inside. What are its side effects? Because Rigvir® is programmed to affect only malignancies leaving surrounding tissues undamaged, the most common side effects associated with cancer treatment such as hair loss, weight loss, or nausea fall behind. Patients normally report fatigue and drowsiness. More rarely - slight temperature rise up to 37.5°C / 99.5°F that lasts up to three days. This is explained by the fact that Rigvir® mobilizes your immune system to fight the disease. Is Rigvir® registered in Australia? Not yet and here’s why. Rigvir® was first registered in Latvia in 2004 followed by Georgia in 2015 and Armenia in 2016. The manufacturer of Rigvir® received ‘Horizon 2020’ grant (the EU funding program) to enter the European market of pharmaceuticals. Because the European region is prioritized, Australia might be a part of the agenda later. For more information about Rigvir in other countries, read about virotherapy in New Zealand. However, you can still qualify for Rigvir® therapy from home at no cost. So, let’s see what steps should be made. Before we go through the list of tumors vulnerable to Rigvir®, there are three requirements for each applicant willing to qualify for virotherapy. You must be 18+ years old because all clinical trials with Rigvir® were carried out on adults only. You must have a confirmed cancer diagnosis because Rigvir® cannot be applied for preventive purposes. 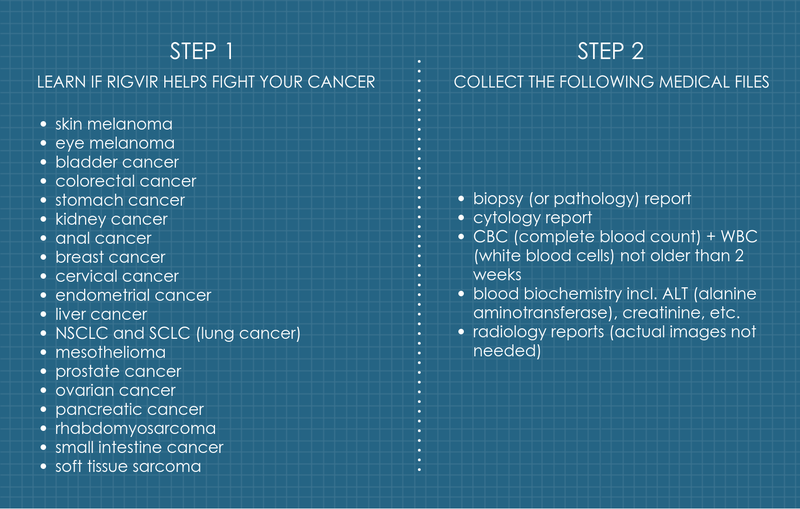 In the left column you’ll find the list of Rigvir® sensitive cancer types in the descending order (Step 1) with melanoma being the most vulnerable diagnosis. In the right column (Step 2) you can see the list of medical files that you should collect to qualify for the therapy. A team of Latvian professionals (an oncologist, immunologist, and a virotherapist) will examine your files to see whether Rigvir® can help in your case. Though virotherapy was originally used to fight melanoma, oncologists apply Rigvir for kidney cancer, Rigvir for stomach cancer, and a number of other diagnoses. This is because a range of clinical trials proved the Rigvir® efficacy on these oncological types and therefore can be prescribed off-label. The initial review of your case is carried out free of charge. The only thing you should do after providing all the documents is wait 48-72 hours to receive approval or disapproval for further treatment. The sooner you start collecting the files, the sooner evaluation begins. And don’t worry about the translation - the Latvian doctors speak English fluently. At the clinic in Latvia you’ll have daily consultations with the doctors, who will track how well your body responses to Rigvir® and adjust the dosage and treatment plan immediately if needed. 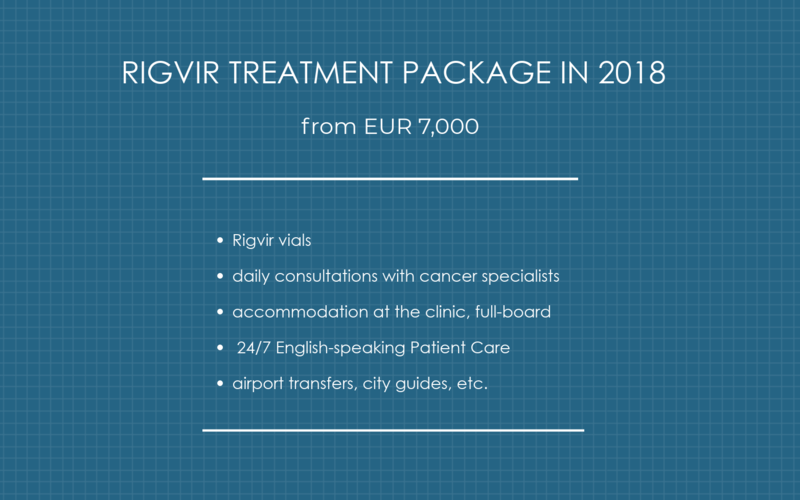 The specialists with 30+ years of practical experience with Rigvir® including the Chief Oncologist of Latvia who often participates in the decision making will take care of you at all stages of your therapy. When in Latvia, you’ll have sessions with an immunologist, nutritionist, as well as with specialists experienced in boosting mental health - a psychologist, art therapist etc. The 3-year survival rate in post-surgery melanoma patients was 46-58%, while melanoma patients who combined surgery and Rigvir® had the 3-year survival rate of 57-84% and a 5-year survival rate of 44-66%. 90% and 70% are three-year and five-year survival rates of eye melanoma patients, accordingly. Patients diagnosed with stage 3 stomach cancer had 5-year survival rate of 24-33%, if treated with surgery, while virotherapy patients had 47-60% survival rate. As for stage II-IV rectal cancer patients, 5-year post-surgery survival rate constituted 41-68%, compared to 71-78% for Rigvir® patients. Chances are you still have questions such about the statistics related to your diagnosis or where to submit your medical files. Please click the button below and we will get back to you within the first 24 hours. IMPORTANT: Remember to double-check your phone number and email for accuracy.